Initialed thousands of years ago, developed throughout the entire history of human civilization, with its origins in the higher divine teaching, profound original medicine, and long history of mind-body-spirit practice, Mind-Body Medicine & Healthology (MBM) is one of the most rapidly advancing and widely used healthcare approaches in modern times. It is also one of the most mystifying scientific fields. Mind-Body Medicine & Healthology de-mystifies this profound science and gives you the tools to maximize its wide spectrum of applications. Mind-Body Medicine & Healthology serves as both a textbook for mind-body medicine students, teachers or doctors and as a guidebook for anyone interested in mind-body health, beauty and longevity. Emphasis on preventive healthcare for people of all walks of life. The author wrote and energized this book in his deep meditated state with wonderful energy and love of human nature, and the sincere intention and goal of helping his readers establish a natural health lifestyle and to additionally help open-minded scientists in different fields establish a new life science, to achieve mental, physical and spiritual health, beauty, happiness and longevity. This book covers mind-body medicine’s most important original teachings, histories, theories, principles, concepts, ideas, secrets and healing techniques. The author introduced creative models, hypothesis, methods, research and experiments. The book also teaches energy checkup methods and healing techniques such as meditation, energy music sound therapy, energy practice and spiritual cultivation, psychological healing, conscious and subconscious practice, healthy living lifestyle, brainwave meridian therapy, preventive health, modern diseases (e.g., cancers, depression, stress, etc.) healing and prevention, and integrative practice. This book also includes many inspiring real healing stories and case reports. Note: Readers can reach author's website at www.imbsi.com/Books/. Dr. Jason Liu, MD/PhD, is the founding president and professor of the Mind-Body Science Institute International, Inc. (imbsi.com). He is a certified Alternative Medicine Practitioner, Drugless Practitioner, Clinical Hypnotherapist, Qigong Master and meditation teacher, and neuron and muscular ion channel physiologist and scientist with quality research papers published on the top medical journals such as J. Biol. Chem., Mol. Pharmacol., etc. Dr. Liu is a mind-body medicine practitioner and researcher, and the composer/producer of Energy Healing - Meditation Relaxation Music Series. Dr. Liu invented Brainwave-Meridian Therapy, an applied mind-body medicine and healthology. Dr. Liu has multiple academic education backgrounds and extensive trainings through his doctorate and postdoctoral programs in the medical schools of UC Davis, California, Miami University, Florida, and Nagoya City University, Japan, followed by the establishment of his mind-body healing and educational institution where he practices and teaches with colleagues. The fields he trained with and practice include quantum physics (his original bachelor education), neuron muscular physiology, biophysics, holistic psychology, hypnosis and meditation, eastern healing arts such as Chinese medicine, Qigong, Taiji, energy healing music composition and healing therapy, Chinese calligraphy, poem writing, etc. He is a certified Chinese Qigong master, and also as he continued to search the truth and cultivate himself, he has been dedicated to mind-body-spirit cultivation as a lifetime discipline. 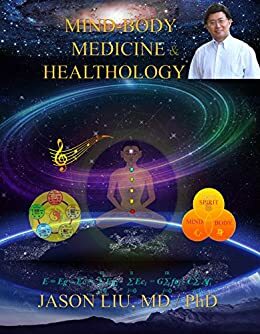 Dr. Jason Liu has written a great reference manual on how to get healthy and remain healthy using Traditional Chinese Medicine combined with a meditation practice. He also offers and recommends his special oriental music with brainwave entrainment to assist with your meditation. The reason for the meditation practice is because he places special importance on the minds ability to heal the body when it enlists the help of the spirit's energy which can be accomplished through meditation. Thus, his Healthology is a combination of the mind, body and spirit. This book is destined to become a classic. It would be even better with the help of professional editing. Philosophically, my only comment would be that although I believe the mind is capable of healing the body in many instances, I feel that there are times where other modalities may be needed. For instance, perhaps someone may need special nutrients which they are ignorant about. Another example would be perhaps added body work would help speed recovery. So, although I agree that cultivating a meditation practice may be the single most important thing a person can do to become and remain healthy, there are probably other things that would also be beneficial. Nonetheless, thank you for presenting your case for Body, Mind, Spirit and Healthology. One of the worst books I've ever read/purchased. There's nothing new to learn here and not well written. Beautiful, beautiful book that I have been waiting for my entire life, to learn the secrets of the universe. This is a book I will read, and re-read. I have been a patient of the author, Dr. Liu since 2007. At that time, I had extreme pain in my left knee upon walking. After doing research regarding my knee's condition, I learned that if I followed the Western Medicine's protocol, my eventual prognosis/treatment would be a complete knee replacement. In April of 2007, I learned of Dr. Liu, and became his patient. He used BMT, as described in detail in the book. My knee healed after approximately bi-weekly treatments for 8 weeks. My knee has remained healed for the past 8 years, despite being 60+ Lbs. overweight. That in itself is a miracle. This book is 400+ pages filled with a treasure trove of information, to include how to strengthen teeth/gums, facial exercises, flu and cancer healing treatments. This book will help you along with" Dr. Liu's Healing Energy CD's", to remove blockages, and to heal the body, mind, and spirit. Rarely if ever do you find a book that has the power to change the outcome of your life. After reading, it has changed my understanding of the universe, my thoughts, and behaviors. This is the book that can do that and so much more. It is the blue print or foundation for living a happy, peaceful, compassionate, fulfilling life.